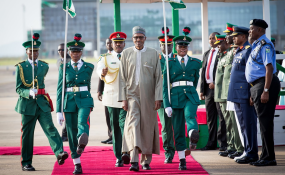 Abuja — PRESIDENT Muhammadu Buhari, Sunday, said that the cancellation of his trip to Kigali, the Rwandan Capital for the Extraordinary Summit of the African Union was to make more consultations especially the stakeholders. The Federal Executive Council, FEC, had on Wednesday last week approved that President Buhari should sign the framework agreement establishing the African Continental Free Trade Area, AfCFTA expected to take place on Tuesday, 21st March, 2018. The framework agreement involves the adoption of common currency and free trade among others within the African Continent. Recall that Nigeria's proposed involvement in the framework agreement had attracted opposition from the private sector and the labour movement. But the Federal Government had justified the involvement of Nigeria in the new policy, explaining that signing the agreement would expand market access for Nigeria's exporters of goods and services spur growth and boost job creation. Besides, the government said it believed that the agreement will eliminate barriers against Nigeria's products and provide a Dispute Settlement Mechanism for stopping the hostile and discriminatory treatment directed against Nigerian natural and corporate business persons in other African countries. This explanation did not go down well with the organised labour that reasoned that the danger inherent in the policy was far more than whatever advantage that could come from it. National President of the Nigerian Labour Congress, NLC, Ayuba Wabba in a statement in Abuja, said that signing the agreement was "extremely dangerous and radioactive neo-liberal policy initiative being driven by the Ministry of Trade and Investment that seeks to open our seaports, airports and other businesses to unbridled foreign interference never before witnessed in the history of the country. "This policy initiative, for instance, will make it possible for a foreign airline to directly do local scheduled flights without employing Nigerians." With the approval given to the President by FEC at last Wednesday's meeting presided by the Vice President, Yemi Osinbajo, some members of Nigeria's delegation had left to Kigali on Friday, while another set had already at the Muritala Mohammed International Airport on Saturday when information came around 1pm that the meeting had been cancelled. A statement signed by the spokesperson, Ministry of Foreign Affairs, Dr. Tope Adeleye Elias-Fatile announcing the cancellation on Sunday read, "President Muhammadu Buhari has cancelled his trip to Kigali, Rwanda, to attend an Extraordinary Summit of the African Union on Tuesday, March 21, to sign the framework agreement for establishing the African Continental Free Trade Area. "This is to allow more time for input from Nigerian stakeholders."